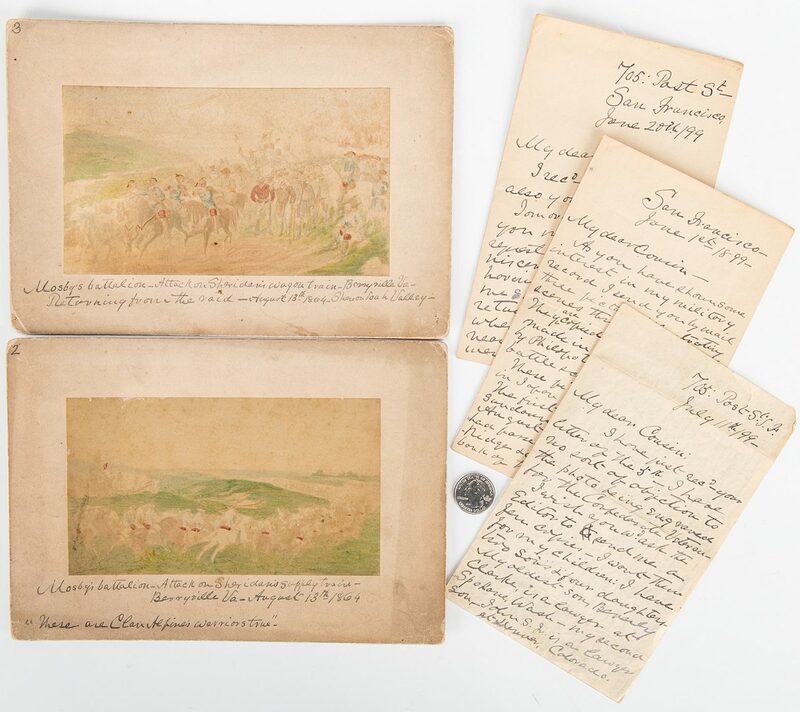 Archive of five (5) items related to John Singleton Mosby, the Confederate "Gray Ghost," including three (3) ALS and two (2) colored lithographs illustrating a raid orchestrated by his command, the 43rd Battalion, Virginia Cavalry, known as Mosby's Rangers or Mosby's Raiders, on Sheridan's supply train. 1st-3rd items: Three (3) ALS. 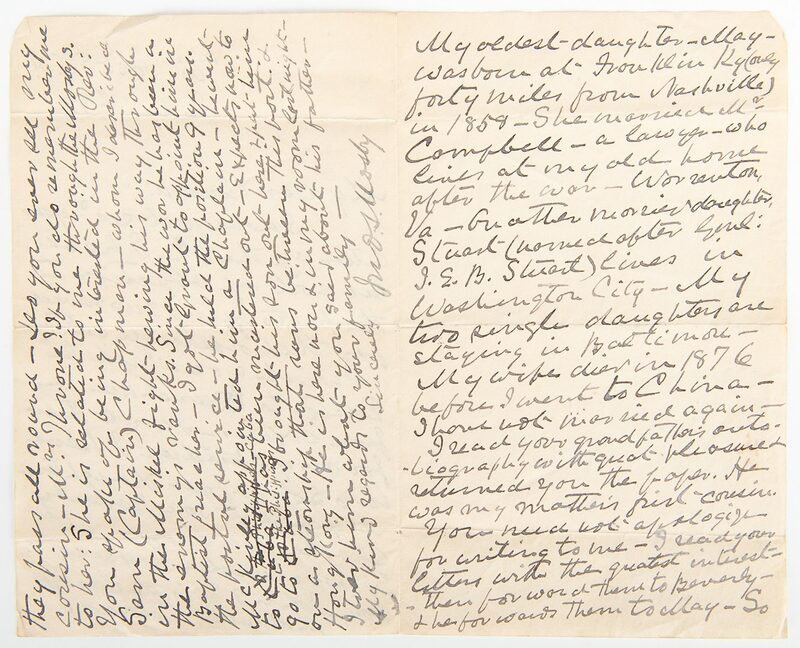 One page handwritten bifoliums. 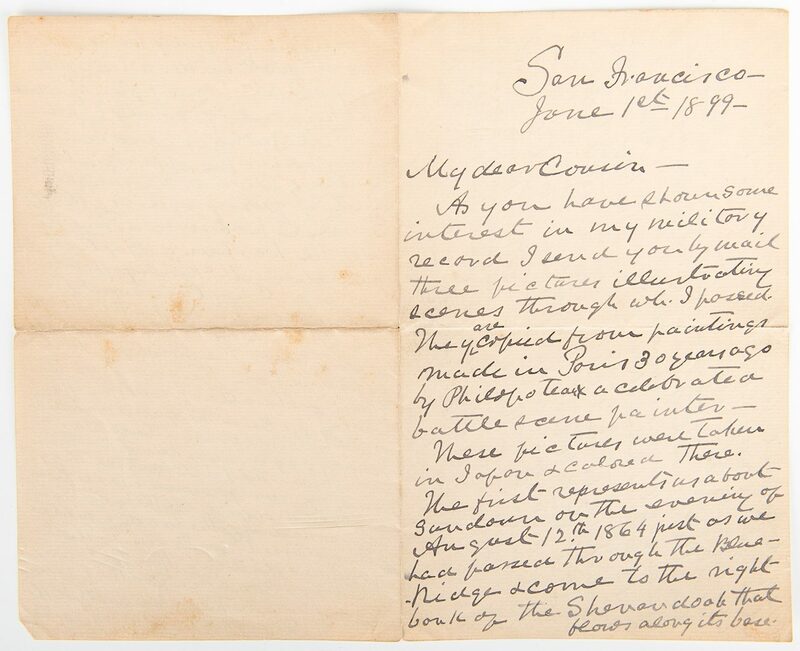 From John Singleton Mosby, at the time of the letters a lawyer for the Southern Pacific Railroad, San Francisco, CA, to Mrs. J. D. Herblin, his cousin, Nashville, Tennessee. 1st item: Letter dated June 1, 1899. 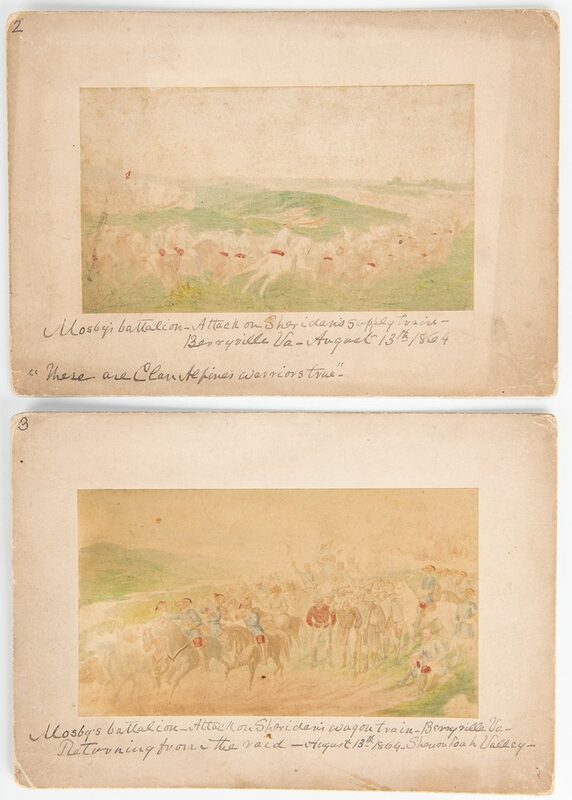 Mosby describes three reproduced illustrations of paintings depicting events that occured during his time in Mosby's Rangers, writing "My dear Cousin–As you have shown some interest in my military record I send you by mail three pictures illustrating scenes through wh[ich] I passed. They are copied from paintings made in Paris 30 years ago by [Henri Felix Emmanuel] Philippoteaux a celebrated battle scene painter–These pictures were taken in Japan and colored there. The first represents us about Sundown on the evening of August 12th 1864 just as we had passed through the right bank of the Shenandoah that flows along its base. 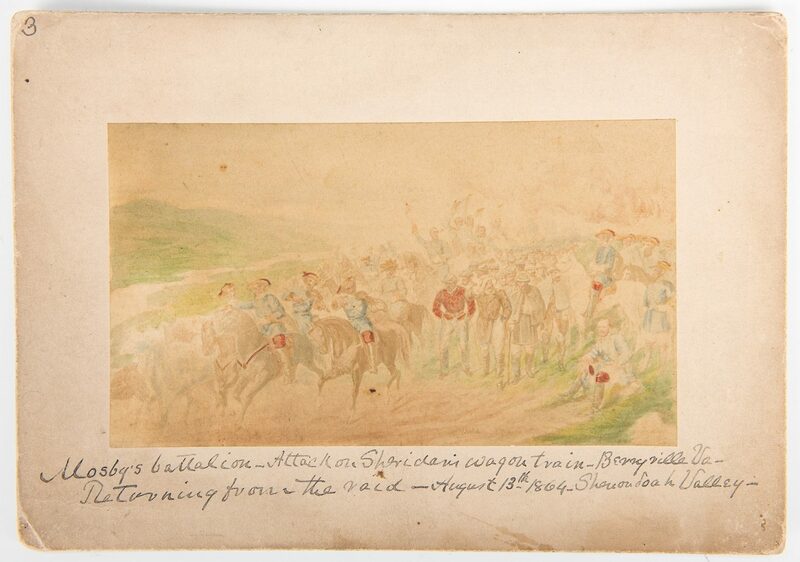 I am on a gray horse in front just under a tree with my right hand pointing while talking to one of my scouts (Lieutenant John Singleton Russell) who is also on a grey horse. The officer who is pointing towards the guard evidently giving orders in Capt: Sam Chapman–Since the war he has been a Baptist minister preacher–McKinley appointed him a Chaplain & sent him to Cuba–In No 2–the attack on Sheridan's train–I am in the front near the howitzer that is firing on the guard for the train–The attack was on the Valley pike–the guard consisted of about 3000 men–there was a heavy fog–I has about 300 men & one gun–the first notice they had of our presence was when a shell dropped in their column & knocked off the head of mule & this stopped the train–The Yankees did not think it was fair for 300 men to attacked 3000 in a fog–So they ran away & left everything–wagons–mules–beef cattle–We got General [Wesley] Merritt's (the same who went to Manila) headquarter teams–with his baggage were several violins–There were several fiddlers among my men–who played tunes on the violin–In this picture (No 3) I am mounted on a grey horse–immediately to my right & rear is my brother [Lieutenant Colonel William Harrison] Mosby who was my Adjutant–he is eleven years my junior–The officer standing on my left is [Lieutenant Colonel William Henry] Chapman]–he was appointed to my office at my request by [General Ulysses S.] Grant–is still in office–Special Agent…The officer in front (mounted) is Major [A. E.] Richard–now Judge Richards of Louisville, Ky–the officer to whom he is talking is Lieut: Ben Palmer of Richmond–the officer sitting down is Capt: Mountjoy who was killed a few weeks afterwards–of course you can distinguish the Yankee prisoners–I took more prisoners than I had men–As you take an interest in "the east course" these pictures may interest you–Sincerely–Jno.S.Mosby". 2nd item: Letter dated June 28th, 1899. Mosby describes his past and upcoming literary projects, writing "My dear Cousin: I recd your letter today–also your husband's–Tomorrow I shall send you my photo as you request–The "War Reminiscences" you speak of were written by me shortly after my return from Hong Kong where I was consul nearly seven years: They were written by request for the Boston Herald & I had no idea when I was writing them that these fugitive sketches [would] ever be collected in book form. They contain only a small portion of my military life. 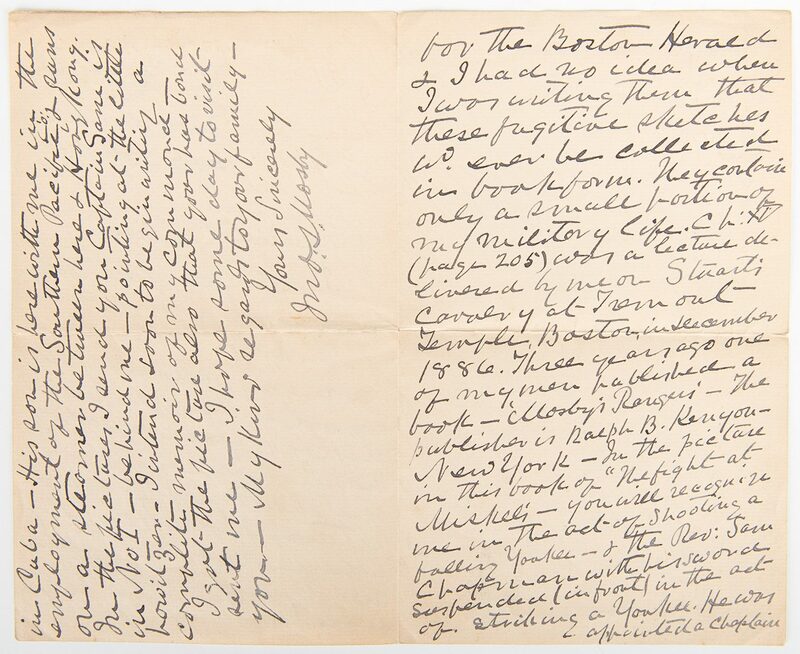 Ch:XI (page 205) was a lecture delivered by me on Stuart's Cavalry at Tremont Temple, Boston, in December 1886. Three years ago one of my men [James Joseph Williamson] published a book–'Mosby's Rangers'–The publisher is Ralph B. Kenyon–New York–In the picture in this book of "We fight at Miskel's–you will recognize me in the act of shooting a falling Yankee–& the Rev: Sam Chapman with his sword suspended (in front) in the act of striking a Yankees. He was appointed Chaplain in Cuba–His son is here with me in the employment of the Southern Pacific Co. & runs on a steamer between here and Hong Kong. In the pictures I send you Captain Sam is in No I–behind me–pointing at the little howitzer–I intend soon to begin writing a complete memoir of my command–I got the picture also that your husband sent me–I hope some day to visit you–My kind regards to your family–Yours Sincerely Jno.S.Mosby". 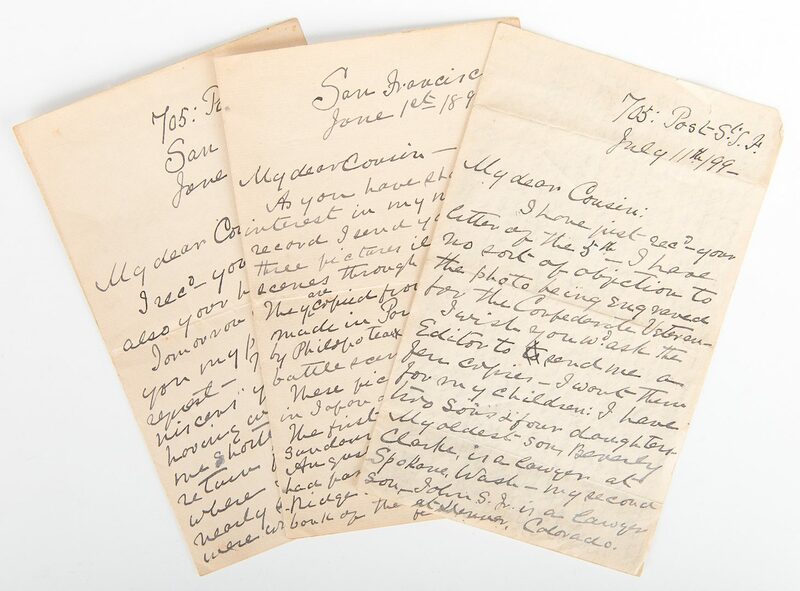 3rd item: Letter dated July 11, 1899. 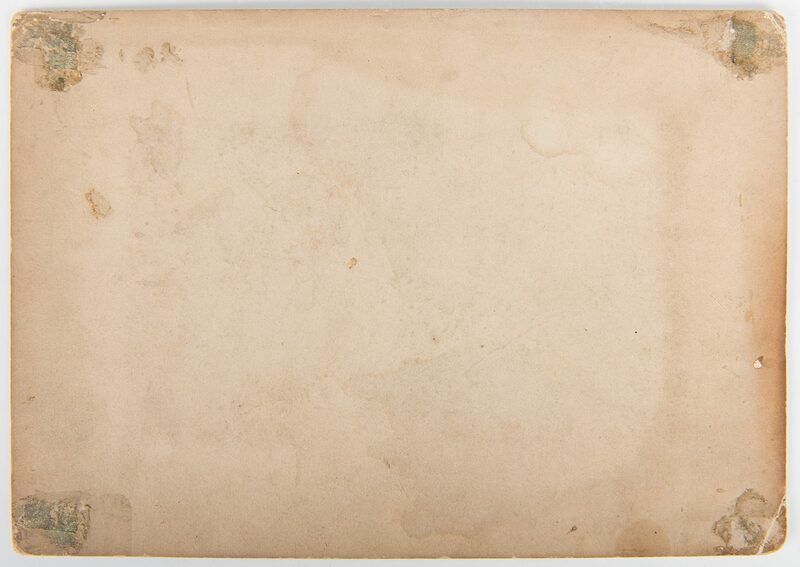 Mosby begins the letter by writing "My dear Cousin: I have just recd your letter of the 5th–I have no sort of objection to the photo being engraved for the Confederate Veteran–I wish you [would] ask the Editor to send me a few copies–I want them for my children…". Mosby names his children, their spouses, and current locations before continuing "I read you grandfather's autobiography with great & returned you the paper. He was my mother's first cousin. 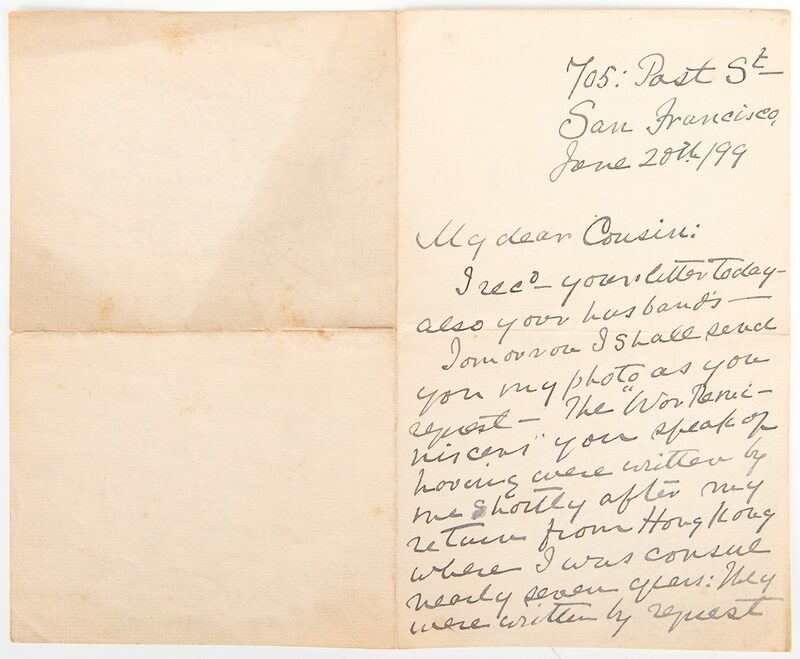 You need not apologize for writing to me–I read your letters with the greatest interest–then forward them to [his daughters] Beverly–she forwards them to May–So they pass all around–Do you ever see my cousin–Mrs. Thorne? 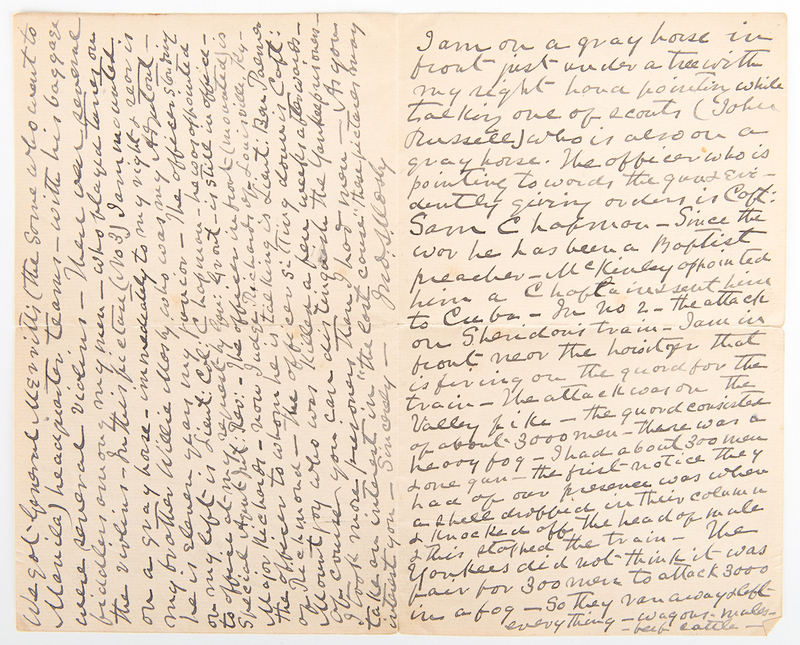 If you do remember me to her: She is related to me through the Mosby S. You spoke of being interested in the Rev: Sam (Captain) Chapman–whom I described in the Miskel fight hewing his way through the enemy's ranks. Since the war he has been a Baptist preacher–I got Grant to appoint him in the postal service–he held the position for 9 years. 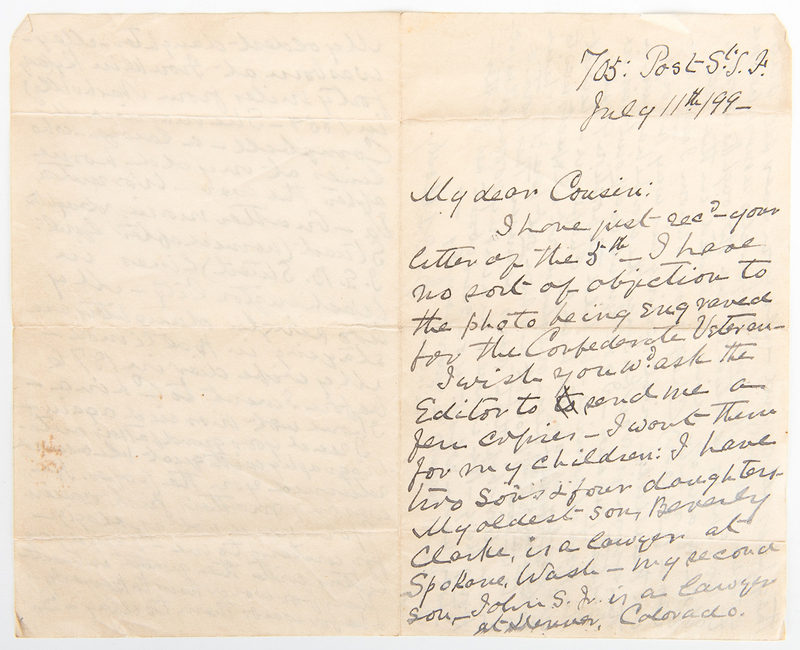 McKinley appointed him a Chaplain–he went to Cuba has been mustered out–Expects now to go to the Philippines. I brought his son out here & put him out on a steamship that was between this port & Hong Kong–He is here now & in my room last night–I told him what you said about his father–My kind regards to your family–Sincerely Jno.S.Mosby". All letters approximately 8" H x 10" W. Biography: John Singleton Mosby (1833-1916), also known by his nickname, the "Gray Ghost", was a Confederate army cavalry battalion commander in the American Civil War. His command, the 43rd Battalion, Virginia Cavalry, known as Mosby's Rangers or Mosby's Raiders, was a partisan ranger unit noted for its lightning-quick raids and its ability to elude Union Army pursuers and disappear. After the war, Mosby became a Republican and worked as an attorney and supported his former enemy's commander, U.S. President Ulysses S. Grant. He also served as the American consul to Hong Kong and in the U.S. Department of Justice. 4th-5th items: Two (2) colored lithographs after paintings by Henri Felix Emmanuel Philippoteaux (French, 1815-1884) titled "2 Mosby's battalion–Attack on Sheridan's Supply Train–Berryville Va–August 13 1864" and "3 Mosby's battalion–Attack on Sheridan's Wagon train–Berryville Va–Returning from the raid–August 13 1864–Shenandoah Valley". 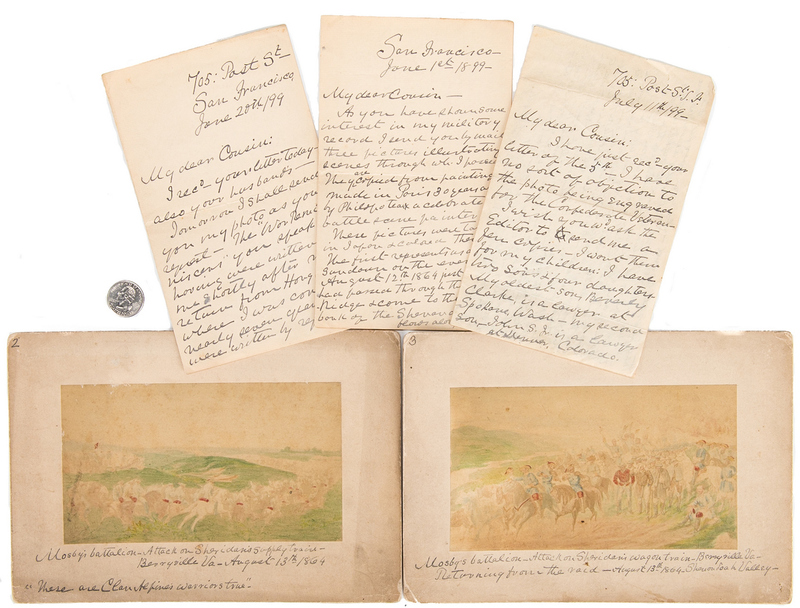 Both images illustrate a raid on Sheridan's supply train described in Mosby's letter dated June 1, 1899. Images mounted to off white card stock with title in Mosby's handwriting centered below, numbered, top left of card stock. Images – 4 3/8" H x 7 1/2" W. Card stock – 7 1/8" H x 10 1/8" W. Biography: Henri Felix Emmanuel Philippoteaux was born in Paris on April 3, 1815. When he was still young he entered the studio of Leon Cogniet, with whom, at a later period, he painted several battle scenes for the gallery at Versailles. He first exhibited at the Salon of 1833. His works could be found in the principal modern museums of France at the time, including those of the Luxembourg, Versailles, Rouen, Strasbourg, and Marseilles. He obtained medals in 1837, 1840, and was awarded the Legion d'honneur in 1846. 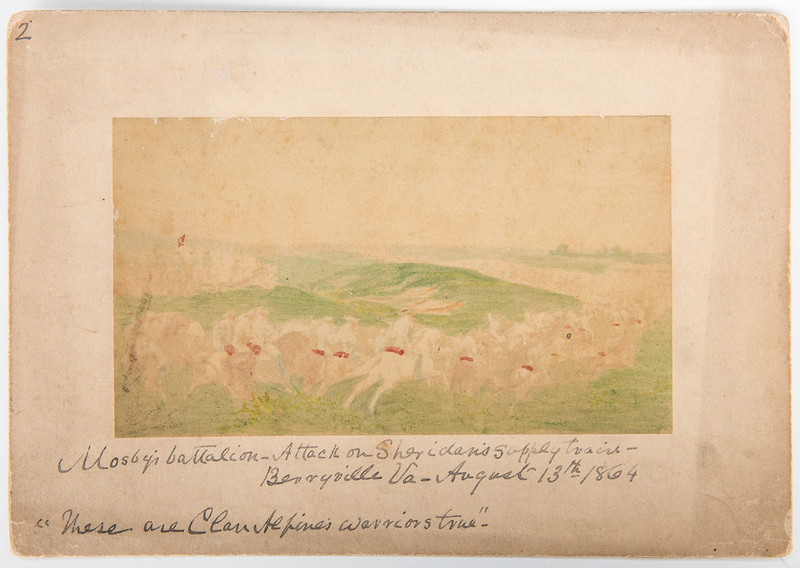 Several noted pictures were painted upon commissions received after he traveled to Algiers. His works were also shown at the Royal Academy exhibition in London. (source: Obituary in "The New York Times", November 10, 1884). CONDITION: All items with toning, foxing spots, etc. to be expected from age. 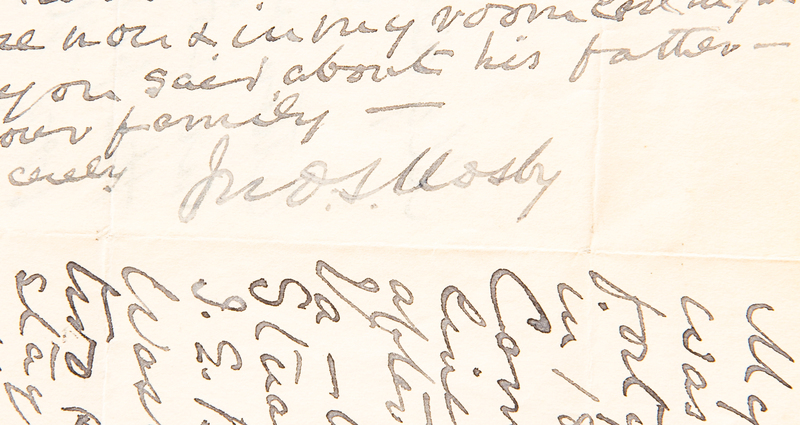 Mosby's signatures in excellent condition. 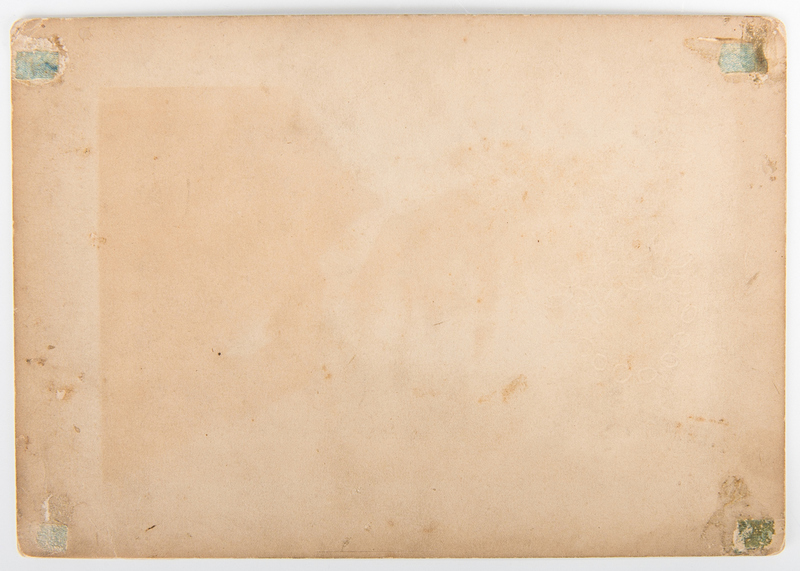 Areas of acid burn to card stock.